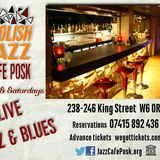 Situated in the basement of the Polish Centre in Hammersmith, the Jazz Cafe POSK hosts live jazz and music sessions every Saturday and occasional Friday nights. "Join us on Fridays & Saturdays for outstanding Jazz & Blues. We are located in the basement of the Polish Social & Cultural Association – POSK in King Street, Hammersmith. 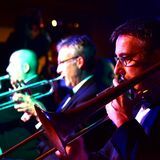 Jazz Café POSK is run by volunteers driven by their love for great live music and providing a friendly environment for upcoming and established musicians to share their music to the community. Please come down and visit us, hear some great music and join in the fun! " What did you think of Jazz Cafe POSK? Situated in the basement of the POSK (Polish) Centre, a fairly unattractive concrete building on King Street, Hammersmith, this jazz gem is a well-kept secret. With its tiled floors and unoriginal interior, the first impression is not particularly welcoming. In all fairness they’ve done what they can with the space provided and a lavish interior may look incongruous in the context of the building. However, the layout of the place is actually quite clever. You walk onto the stage/dancefloor and then go up the steps to the vast seating area which has a large number of tables and poufs. Two spacious booths at the back of the room provide lots of comfortable seating and, if the venue gets packed for a big name concert (around £5/£10 per ticket), the steps are full of jazz enthusiasts, too. They even provide cushions to sit on. While the bar may not look impressive, it’s well stocked and the staff are very friendly and helpful. It’s open in the evenings, mainly Friday/Saturday, but it is also available for private parties and events. Fairy lights hang from the ceilings and the dim lighting and dark décor create a relaxed ambience, especially when the soft sounds of jazz fill the space. The front of the room, closer to the stage, is practically silent during the concerts as the punters enjoy the musical stylings. Towards the back of the venue the sound is at a perfect volume because you can hear the tunes but you can also chat freely. The crowd is a mix of Poles, locals and a small international contingent, especially during the monthly big band nights with Willie Garnett. Jazz trios, orchestras and big bands all happily co-exist on the bill at Jazz Café POSK. If you’re lucky you might get treated to an impromptu after hours music session by someone from the audience, which is very much encouraged. There’s a very limited number of bar snacks to choose from but the quality of the dishes makes up for the lack of choice. The pierogi (Polish dumplings) are tasty and at £5.50 will leave you satisfyingly full. If you’re a fan of cabbage, the meaty bigos (Polish stew, also £5.50) is well prepared and served up in a hefty portion, too. Polish beers such as Tyskie and Zywiec (both £3) are both decent choices. Whiskies such as Jack Daniels or Famous Grouse are priced at £2.50 for a single and £4 for a double, and the same prices apply to house brandy, tequila and Campari. The house vodka is slightly cheaper (£2/£3.50) than the offerings from Poland (£2.50/£4) but it being a Polish venue it’s a crime not to indulge in an ice cold shot of Wyborowa. House wines by the glass are around the £3 mark and the price pretty much sums up the taste. The sauvignon blanc and the merlot (£13 for a bottle) are a much wiser choice. Jazz Café POSK isn’t the most spectacular of venues, but with big names such as Jarek Smietana counting it as one of his favourite places to play, this little piece of Poland in W6 is very fondly thought of by both its patrons and the performers.